SEATTLE — "Ban pre-shredded cheese. Make America grate again." "There's no way everybody was kung fu fighting." Those are just three of the pearls of wisdom seen recently on the Wallingford Chevron marquis. It started in 2005 after a remodel included an old-school readerboard. "My manager looked at me and said, 'What do you want me to put on the readerboard?' And I was in the middle of something and I just said, 'Do something funny,' " says owner and sign curator Jim Bernard. So instead of posting the latest low-price on milk in the mini-mart, we get, "The second mouse gets the cheese." Or marital advice like "My wife said I never listen to her...or something like that." There are lessons for life like "Don't give up on your dreams, keep sleeping." 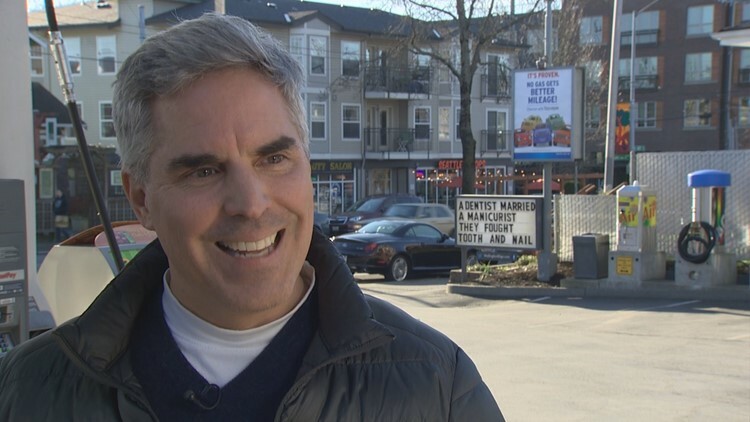 Chevron owner Jim Bernard says his gas station readerboard is a "trust with the neighborhood." Bernard says he's had an unspoken agreement with the neighborhood. "They rely on us to do something funny, but not too over the top. Not too sentimental. Not political. Not too edgy. Somewhere in between that kind of gets them." And you might not get all of them. They often make passersby think. "It's something they look forward to. And in return for that. I mean look at the sign. It's just sittin' out there, next to where thousands of people walk every day. They don't mess with the sign." Peg is a fan and sees the messages often on her daily walks. "There's a lot to frown about. So this is somethin' to smile about," she says. Fellow fan Skyler follows the sign on its Facebook page. "The best one I ever saw was Britain doesn't have a blood bank, they have a Liverpool," he says. He loves that he can get fuel AND philosophy here. "It just kinda adds more character to already cute Wallingford. So you could be havin' a rough day, you see a joke...kinda just makes your day," he says. Jim says ideas come from customers, staff, the web. "We steal them," he admits. He says when a car crashed into the sign, they considered making a change. "In the midst of all that, we asked ourselves, do we want to modernize? And go with electronic and all that. And at the end of the day, we kept with what we had because I think that's part of the charm." The next message after the accident? "Thanks for making our sign a hit."